Nintendo has another console you can take with you on the go, but for the best value in dedicated, portable gaming, Nintendo 3DS remains on top. And this Black Friday game deal makes the choice even easier. 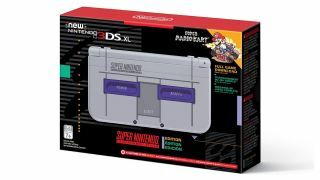 For just $149.99 on Amazon, you get a New Nintendo 3DS XL - Super NES Edition with a bundled-in download of Super Mario Kart. Whether you have fond memories of switching on that concave, purple power button yourself or just have an aesthetic appreciation of the classics, this special edition design oozes retro appeal. Over more than seven years on the market, Nintendo 3DS has built up one of the best game libraries of any system. As this SNES skin suggests, there's a bunch of nostalgia-friendly stuff available on the console - spruced up or totally rebuilt Nintendo classics like The Legend of Zelda: Ocarina of Time 3D or Metroid: Samus Returns. There are ample original games available as well; check out the Bravely Default series if you need your next JRPG fix. As for the console itself, there are a bunch of different kinds of 3DS out there. This system in question is a New Nintendo 3DS XL, which is the most capable version available, complete with a very cool glasses-free 3D effect in supported games. Don't worry, you can enable, disable, or tweak the effect whenever you like via a physical slider. The "New" moniker denotes that this system has more powerful innards, which is required for demanding games like Xenoblade Chronicles. Another great option if you know you don't like the 3D feature is Nintendo 2DS XL - but 2DS XL isn't available with this slick SNES design! I mean, the back even looks like it has a big cartridge slot on it, so it looks like a full-on SNES when you have it opened up. Tough to argue with that. If you want to start playing your way through a stupefyingly deep and high-quality portable gaming library for the first time - or upgrade an old system - you really ought to give this 3DS XL deal a look. And check out or Cyber Monday Nintendo deals for more savings.